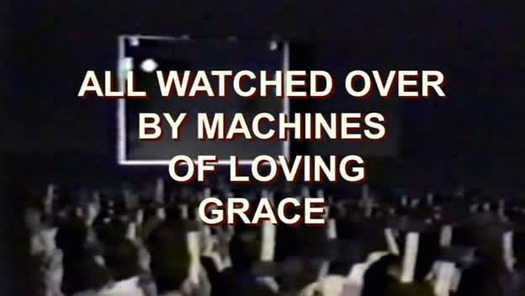 Adam Curtis’ new documentary currently showing on BBC is All Watched Over By Machines Of Loving Grace. The Century of the Self – how the masses are subdued with consumerism and controlled via psychoanalytic techniques courtesy of Freud and nephew Edward Bernays. The Trap – how models of human behaviour as base, solipsistic and selfish informed government policy and the construction societal norms (see also Neo-Libs, Game Theory & Prozac). as a result of the above that governments primarily serve the needs of corporate elites rather than those of the masses, including most obviously bank bailouts in this country, but also more complex financial constructions like how the IMF turned American corporate investment losses in South Korea and Thailand and turned them into a loan for the people of those countries to pay off. All Watched Over By Machines Of Loving Grace feels weaker than his previous documentaries – although so far only the first episode has been screened. Choosing Ayn Rand who has long since been the simplest punchbag for any liberal commentator, just to say once again the selfishness advocated in Atlas Shrugged and The Fountainhead is not moral, or ‘good’ seems a bit weak. Especially as Curtis focuses heavily on Rand’s own wretched personal life that conjecture might suggest lead to her penning such bitter narcissistic drivel. It is a strange construction of a documentary however as the title would suggest somehow computers are to blame for all these observable issues with society. Yet, they hardly get a mention. Perhaps 10% of this first episode that talks about computing, and even then it feels utterly disjointed from previous statements, so it’s almost impossible to see the argument he’s building. The first concept is along the lines of – some entrepreneurs in silicon valley are adherents to Ayn Rand’s philosophy. As a result they’re very driven to fill their personal bank accounts and look out for number 1. But this is just business, no? It’s not computer’s making them think this! He moves on to discuss how the internet has been feted as allowing us freedom from central governmental rule, and demonstrates how it often engenders harmonious working together. Somehow this was supposed to demonstrate how that makes it individualistic and narcissistic, but there just wasn’t an example to show this. And of course with so many examples of the exact opposite, such as communities coming together virtually to support the Arab Spring, etc. The only really interesting aspect of modern computing, particularly in the age of social media, that he briefly touched on was the Commodification of Self. But he includes only a few minutes of a disenchanted forum user who suddenly realised her online contributions to corporate owned boards were being used to encourage other users to read that board, and therefore make money for the corporation. Gee, you don’t say. It would be great if the series develops to include a stronger analysis of how and why we create our ‘online brands’, what that might mean long-term for our concept of self, and how across so many platforms it is commodified by others to make money. Facebook, Google and most of the other big boys are after all, advertising companies that have a sideline in nifty software they’ll give away free as long as you can be advertised to, which in itself is interesting, and even more so with platforms like Twitter struggling to ‘monetise’. At what point does the corporate agenda mean people switch off those platforms? Perhaps we can persuade Rupert Murdoch (or whichever mercenary Murdoch is currently holding the purse strings) to buy another social network, like MySpace, so we can watch the speed of disgust sinking in to it’s users, and how quickly people drop it like it’s hot.